The past week has seen a whirlwind of social media activity around the death of Fidel Castro, Thanksgiving, and Black Friday. 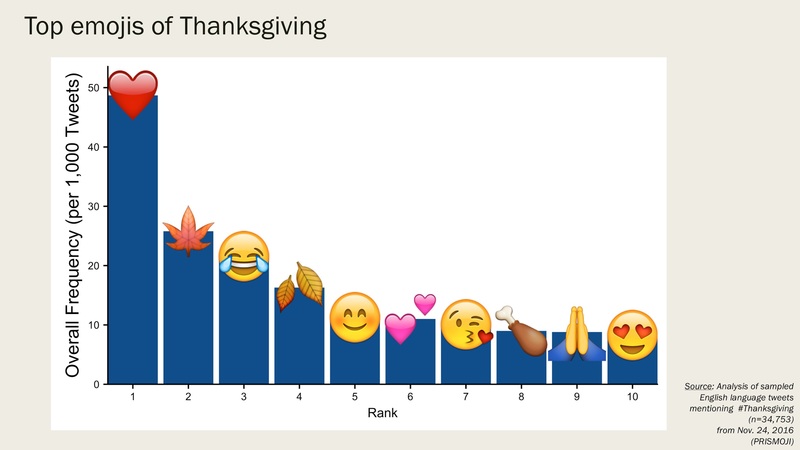 We were curious about how people used emojis to discuss these topics so we looked at some data from Twitter. 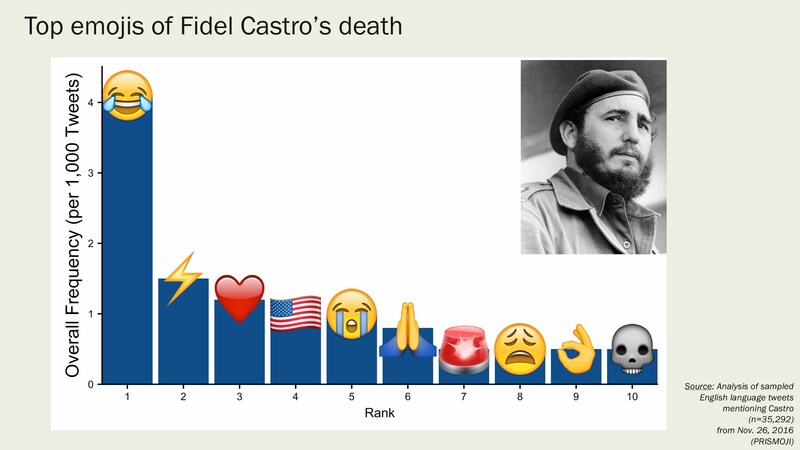 As DJ Khaled is fond of saying, “it’s a cold world out there” and this is apparent when looking at the top emojis used to refer to Castro’s death. We find that 😂 face with tears of joy and 🇺🇸 US flag were mostly used to express anti-Castro sentiment while ❤️ heart and 😭 loudly crying face were evenly split between anti-Castro and pro-Castro usage. 🙏 Person with folded hands and 😩 weary face have been frequently used to express mourning for Castro’s death. ⚡️ High voltage sign makes a surprise appearance and is often used by news bots (i.e. “⚡️ How the world is remembering Fidel Castro.”) 💀 Skull, usually an ironic emoji, is here used literally to refer to death. Thanksgiving related chatter included emojis representing love and affection; for example, ❤️ heart, 💕 two hearts, and 😘 face throwing a kiss. We also found that seasonal fall emojis such as 🍁 maple leaf and 🍂 fallen leaf as well as 🍗 poultry leg have been popular. Black Friday tweets this year included shopping related emojis such as 🎁 wrapped present and 🎄 Christmas tree. Brands also used emojis such as 🔥 fire and ‼️ double exclamation mark to advertise sales. 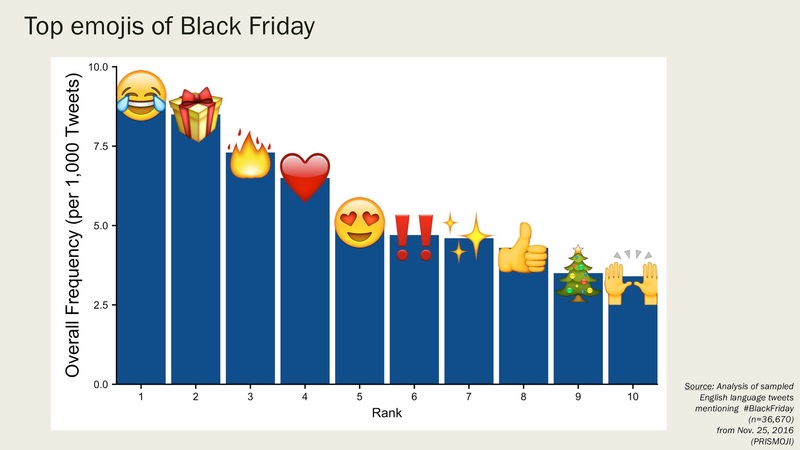 😂 Face with tears of joy was the top emoji in Black Friday related tweets, and it outranked ❤️ heart and 😍 heart eyes suggesting sentiment about Black Friday may remain more skeptical than warm and loving. Hamdan Azhar, a data scientist and journalist, is the founder of Prismoji and recently wrote about emoji use in the US Elections. Hamdan Azhar is a data scientist, journalist, and the founder of PRISMOJI.